Home » Why You Need to Aerate Your Fish Tank? Why You Need to Aerate Your Fish Tank? Maintaining a fish tank isn’t as simple as getting an aquarium and putting fish inside. A lot more goes into keeping your pets going as well as could be. And whether you have a 29 gallon aquarium or a 75 gallon aquarium or even one of those unique fish tanks, one of the things you have to worry about is ensuring there’s enough oxygen in the water. That’s where aeration comes in. Aquarium aeration is the process of putting oxygen in the water. In many cases, water return from the aquarium filter already aerates the water sufficiently. But if you want to make sure that you achieve optimum aquarium aeration, then you have to go a bit above and beyond that. When oxygen enters the aquarium water, it does it on the surface. To a lesser extent, it also happens when the bubbles pass through the water column. While this is happening, carbon dioxide is also given off. This process is called the gas exchange. Long story short, the larger the surface area of the water, the more gas exchange opportunities. Putting that into perspective, that means that while two 29 gallon aquariums may hold the same volume of water, the gas exchange will vary if one of them is tall and narrow and the other is short and wide. When do you need more aeration than what’s happening at the water surface then? Water temperature: As it increases, the less it will be able to hold oxygen. Salt concentration: The saltier the water, the less oxygen it will hold. Fish medication: Certain meds impact how much oxygen the fish is able to take in. Stocking levels: Higher levels means more oxygen is being used. When you have any of the above conditions, additional aeration may be required. Actually, if you just don’t want to worry about it, let’s just put it this way. Even healthy aquariums can benefit from aeration. How can you increase aquarium aeration? By adding a spray bar to the filter’s outlet. By using a power head to increase water movement. By using an air stone or bubble curtain. By doing additional water changes. Speaking of aerators now, if you’ve already tried looking at aerators for your tank, you more than likely found the usual air stone or bubble curtain. They’re really not bad. In fact, they can get the job done quite well. (I did a review of one here). Here’s another kind you may want to look at, though. Small and easy to hide. Dimensions: 3.5 x 3.5 x 9 inches. 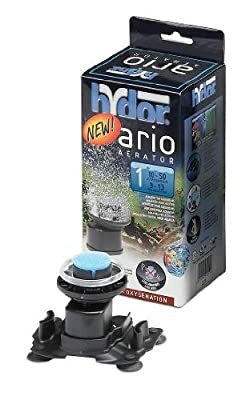 The ARIO 1 Aquarium Aerator by Hydor is supposed to oxygenate and “pleasantly decorate” your aquarium both. I personally don’t doubt the oxygenation part. The decorating part, however, may need more creative skills. It’s tall, and may be hard to cover with gravel completely. This is an internal air pump and very quiet, so there is that. And it does come with everything you need, unlike air stones that require additional purchases of tubing and pumps to make them work. Creates dramatic mist of bubble. Can be cut to fit. Dimensions: 1 x 1 x 7 inches. This bubble wall is available at Hayneedle and manufactured by Penn Plax. It’s a nice variation to the usual pebble. It also has the capacity to be cut to fit your aquarium size or joined together to create more effects. However, if you prefer that your aerator be a bit more than just a little pebble or wall and actually add more to your tank aesthetically, then you might want to take a look at this instead. Suitable for freshwater aquariums up to 52 gallons. Dimensions: 5 x 5 x 4.5 inches. What’s not to like about this Volcano Kit? It’s almost the same as the Hydor ARIO 1 but with a hand-painted volcano ornament that actually does a good job of hiding it without taking away from effectiveness. As one other review puts it, this volcano “rocks”. Aerators do a lot in helping maintain the health of your fish. Consider getting one today.